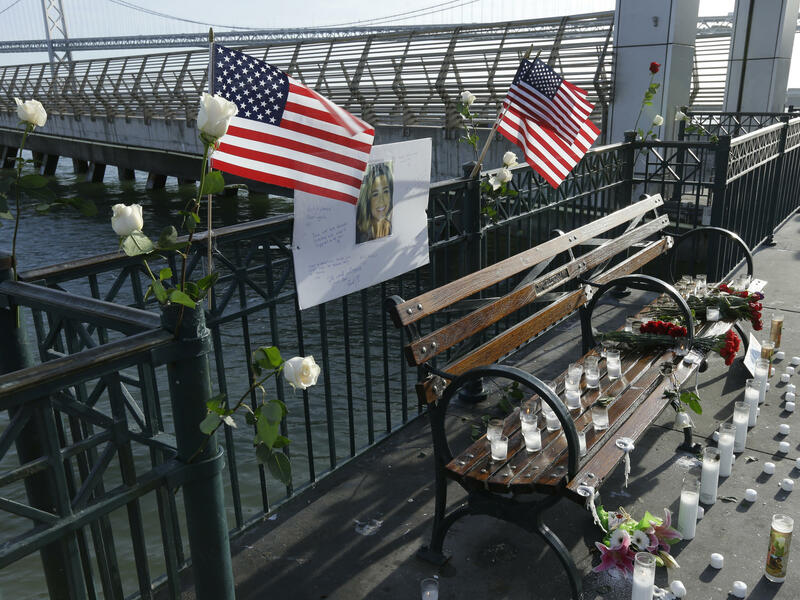 A memorial site to Kate Steinle is seen on San Francisco's Pier 14 on Dec. 1, 2017. A federal appeals court has dismissed her parents' lawsuit against the city for not telling immigration authorities when the man who killed her was released from custody. A three-judge panel of the 9th Circuit Court of Appeals, in a unanimous decision, ruled that San Francisco's then-sheriff, Ross Mirkarimi, violated no federal, state or local laws when he released Juan Francisco Lopez-Sanchez, also known as José Inez Garcia Zarate, on a minor marijuana charge without notifying Immigration and Custom Enforcement. The ruling upholds a lower court in dismissing "a general negligence claim" against the city filed by Steinle's parents. Their suit alleged that Mirkarimi drew up a memorandum instructing city employees to limit the information shared with federal officials about the release of unauthorized immigrants from the San Francisco jail. "Our holding today makes no judgment as to whether or not the policy established by the Memo was wise or prudent. That is not our job," the panel wrote. The judges said city's policy did not violate federal law and that Mirkarimi had a right to enforce the memo. "The tragic and unnecessary death of Steinle may well underscore the policy argument against Sheriff Mirkarimi's decision to bar his employees from providing the release date of a many times convicted felon to ICE," wrote Judge Mark J. Bennett, a Trump appointee. "But that policy argument can be acted upon only by California's state and municipal political branches of government, or perhaps by Congress — but not by federal judges applying California law as determined by the California Supreme Court." President Trump called the verdict "disgraceful" in a tweet. He has frequently mentioned the case when criticizing local "sanctuary city" policies.